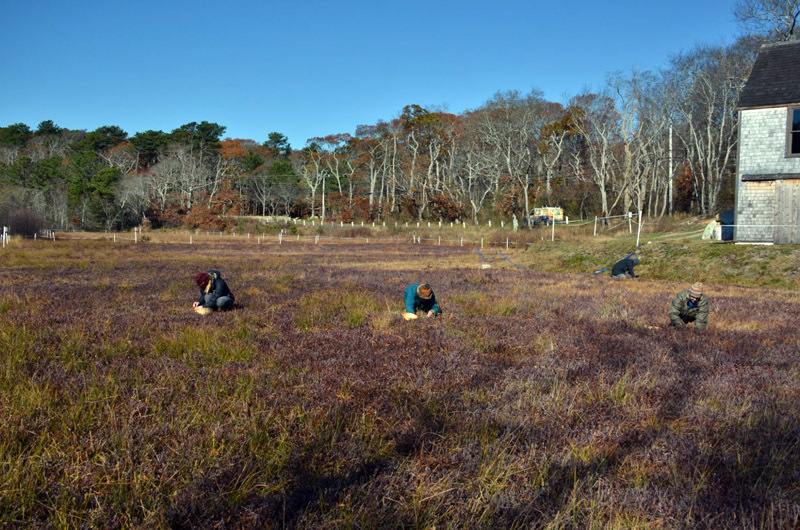 Gleaning at the Vineyard Open Land Foundation cranberry bogs. The Martha’s Vineyard Boys & Girls Club no longer charges for after-school snacks, because so many children don’t have money to pay for them. The Island Food Pantry serves nearly 500 families a year. Senior citizens Islandwide rely on Meals on Wheels, food distributions and low-cost lunches at elder centers. One of every four students in the Vineyard’s public school system qualifies for a free or reduced-price lunch. Parents are skipping meals to feed their kids. Hunger is a part of daily life for many Vineyarders, although it is not always visible. “My anxiety is through the roof,” said Esther Laiacona, a single working mother of two young children who lives in Edgartown and relies on the federal Supplemental Nutritional Assistance Program (SNAP, formerly known as the Food Stamp Program) to help make ends meet each month. “It’s meant to be supplemental, so you still need a cash budget to meet your food needs,” she said. About 115 Island kids a day receive free after-school snacks at the Boys & Girls Club in Edgartown, and that number is growing, said executive director Jessie Damroth, an Island native who recently returned to take the helm at the club. One of her first orders of business when she took over in September was to abolish the paid snack counter and vending machines that had served only children with money in their pockets. Now the Boys & Girls Club snack service under Ms. Damroth has evolved into a program called Healthy Happy Kids, soon to launch officially with a menu of rice bars, yogurt bars, pasta bars, oatmeal bars and bento box bars. A nutrition expert will train club staff over the next few weeks, Ms. Damroth said. Varying statistics from a patchwork of sources make it difficult to sketch a comprehensive picture of hunger on Martha’s Vineyard. 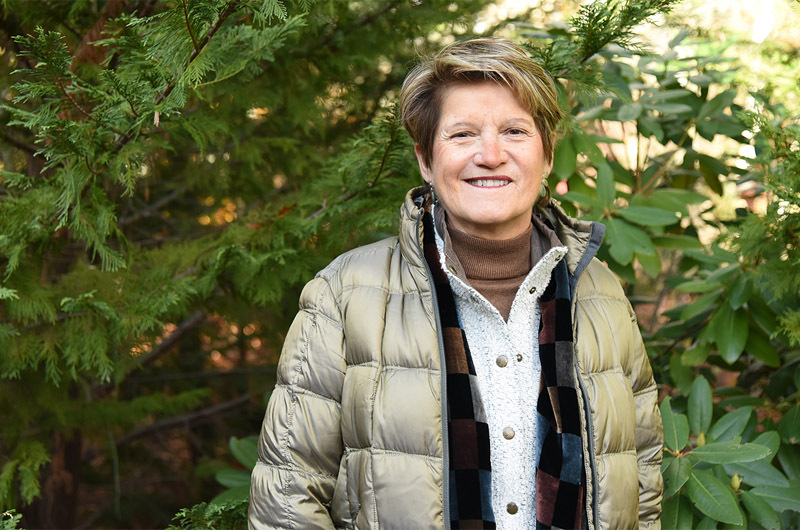 “We still have to get our hands exactly on the numbers,” said Island Grown Initiative executive director Rebecca Haag, who is spearheading a movement to make good food available to Islanders of all incomes. But recent figures from social service agencies indicate that the Vineyard is a much hungrier place than many Islanders and most visitors might believe. More than 300 Island households, totaling 576 people, received SNAP benefits during the month of March, 2016, according to information provided by the state Department of Transitional Assistance in Greenfield. The amount of food assistance provided to Islanders through the program during that month totaled $34,235, via electronically-funded bank cards that heads of households use to buy food at local markets. Intended to supplement income, the cards are replenished with fresh funds on the first day of each month. In her work as a services counselor for Dukes County, Vineyard Health Care Access and Community Action for the Cape and Islands, Ms. Laiacona helps Island residents with referrals for social services. She said she meets many other Islanders who are striving to cope with food insecurity, as well as steep utility bills and housing costs. “Starting Oct. 1, I did about 31 food stamp applications and 24 fuel assistance applications,” she said. “I also provided emergency food assistance to about 15 households.” Families with urgent needs received help from her office, Health Care Access and the Committee on Hunger. She stores food in her own kitchen and car, for when emergencies occur after hours. “I saw an average of four people a day in October alone, so about 80 people in one month,” said Ms. Laiacona, whose office hours are four days a week at the county administration building near the airport. “Every single person had a food need of some kind,” she said. Many clients already received SNAP benefits but had encountered some kind of glitch, such as losing the SNAP card or needing to renew it, or simply had a food gap that needed to be met. “The food pantry opened, so many were referred to the pantry,” she said. Many of her clients are women, particularly single mothers. Most are of working age. “I see a lot of people born in the 1950s,” she said. “They’re not old enough to retire, but something has changed in their job situation — age related, or an injury or illness.” Other clients are homeless, or may have just been released from jail. “They haven’t eaten in days; they’re starving,” Ms. Laiacona said. Young people aged 19 to 23 make up the smallest proportion of people seeking aid, she said. Along with small children, single parents and people who are ill, elderly Islanders are among the most vulnerable to food insecurity, with hundreds a day relying on free and low-cost meal services. 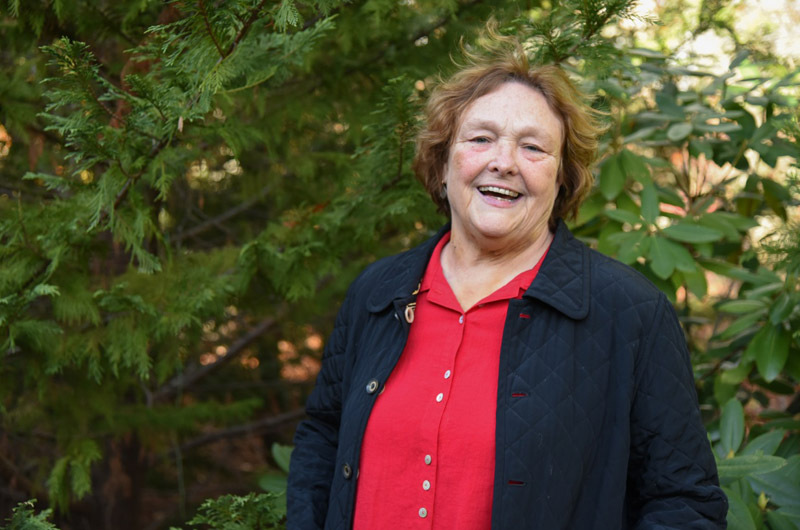 Jacque Cage, a longtime leader in social work on the Island who works with Elder Services of Cape Cod and the Islands, said her senior nutrition program served 46,739 meals to Vineyard seniors in the 12 months from July 1, 2015 to July 1, 2016. The nutrition program operates Meals on Wheels and senior dining centers. Hunger is a part of daily life for so many Vineyarders that at Ms. Haag’s prompting, more than a dozen community agencies, nonprofits and volunteer groups have formed a network in response. In late October, Island Grown Initiative, the Boys & Girls Club, Vineyard Committee on Hunger and Martha’s Vineyard Community Services joined other Island organizations for a first-of-its-kind Island food equity summit. Vineyard business owners, including Meg Athearn from Morning Glory Farm and Steve Bernier of Cronig’s Markets, were also among the 30 participants, as were several representatives from Wampanoag Tribe social services. The all-day event yielded three working groups that will be reporting back after 90 days in late January, Ms. Haag said. Each team is studying a specific problem that emerged during summit discussions: data collection and communication in order to understand the scope of the Vineyard’s hunger problem; reaching children with fresh food; and improving the infrastructure (trucking, sorting, processing and storage facilities) needed to support Island organizations providing food to those in need. A more informal gathering, over savory Indian food last Sunday at the Chilmark Community Center, celebrated the work of the Island Grown Initiative’s gleaning volunteers. Gleaners work in partnership with Island farms and market gardeners to harvest surplus produce — greens, potatoes, squash, fruit and more — which is then donated to feed families around the Vineyard. Morning Glory Farm, the gleaners’ first farm partner in 2009, recently reached a milestone of 100,000 pounds of fresh produce donated through the gleaning program. “We’ve harvested 21,352 pounds for the season and we’re still counting,” gleaning program director Jamie O’Gorman told the luncheon group. 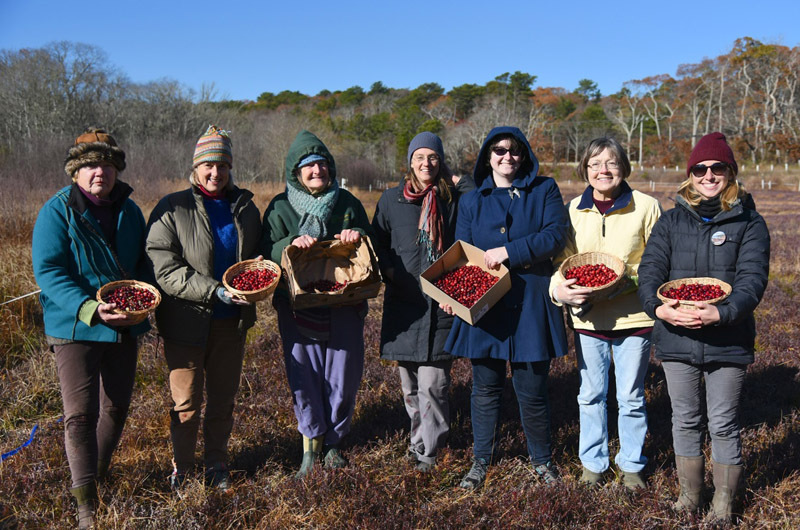 One of the final gleans of the season was held early this week at the Vineyard Open Land Foundation cranberry bogs off Lambert’s Cove Road in Vineyard Haven. Like all the produce gleaned this year, the cranberries will be donated to community groups including senior centers. When freshly-gleaned fruits and vegetables come into the Anchors in Edgartown, seniors “grab them up,” council on aging chef Diane Wall told the luncheon group. Yet apart from a banner celebrating the gleaners’ achievements, and the purple Food Pantry donation boxes at Island supermarkets, there are few external signs that hundreds of Islanders are struggling to feed themselves and their families. More than 11 per cent of the Vineyard’s year-round population lives in poverty, according to the U.S. Census Bureau’s Small Area Income and Poverty Estimates. Meanwhile, Thanksgiving was a little easier this year for about 250 Island households after Family-to-Family, a program of the all-volunteer Vineyard Committee on Hunger, distributed packages of turkeys, produce and other groceries purchased with donated funds. The next Family-to-Family distribution takes place Dec. 16. The hunger committee is seeking donations to help purchase food for Christmas meal packages. “This is the time of year we have to get our contributions,” said Betty Burton, who leads the Committee on Hunger. 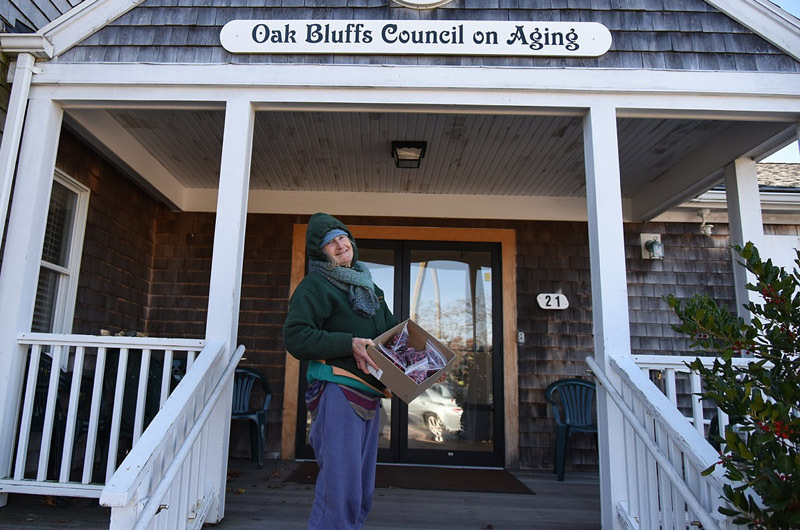 On the Vineyard, “hunger has many faces,” Ms. Haag said. This is the first in a series about hunger and food insecurity on the Vineyard. Why would a parent live in one of the most expensive communities in the country if they didn't have the skills to make enough to feed their children. Move to a place that you can prosper and take care of your children. Yikes, did you even read that article? What an unkind, uneducated comment. Uneducated?? Ha. I have an MBA and work 3 jobs to take care of my family. It's very hard to live here and prosper but jobs are plentiful, although low paying, but if you work hard you can make it. If you're not that motivated than go somewhere where your skill set will provide for your family. It's not rocket science. No one owes you anything. That has to be the most insensitive comment ever! So only rich people should live on a beautiful island,poor people should live someplace else?? Hunger exists everywhere, and there are many reasons a parent might be living on the Vineyard. It's closed minded, thoughtless and unkind to make such a statement, but perhaps a sign of the times. I would like to help these organizations which are trying to support these families though these difficult times. If all the low income workers just up and left the island, which is hard to do on a low income, what are the rest of you going to do? Are YOU going to work at grocery stores, drive cabs, clean your own houses, wait tables, scoop your own ice cream, do your own home repairs and remodeling jobs, cut your own grass? What an ignorant, unkind comment. And what about people whose families have been here for generations? Should they leave their homes to satisfy the ugliness and greed of people like you? Talk about a comment made by a member of the community who probably shouldn't be living here with that attitude! Cassandra is exactly right. Who do we expect to work in all walks of life on the Island and raise families that have all of the American opportunities that we value in this country and on Martha's Vineyard. I have been here for a generation. With four kids it's really hard to make a living. If I didn't work really , really hard to stay here I'd take a look at reality and move to a place where I could feed my children. What an abhorrent idea that a parent thinks someone else is responsible to take take of their children. Do you know how much it costs to relocate? And there is no guarantee you will be better off when you get there. We have a truly caring community and should be able to take care of our own. If you would like to support the Family to Family holiday food distributions, checks payable to Family to Family can be sent to VCOH, P.O. Box 4685 Vineyard Haven 02568. Thank you for doing wonderful things for those in need. The Martha's Vineyard Boys & Girls Club has established a fund for our Healthy Happy Kids food program. Donations can be made online through our website http://www.mvbgclub.org or via mail: Martha's Vineyard Boys & Girls Club, Martha’s Vineyard Boys & Girls Club PO Box 654 Edgartown, MA 02539 We also looking for volunteers to help distribute meals at our facility. Good article never realized but I do understand. Keep up the great work. I am doing gleaning for last 6years,what a wonderful thing to do for a community,1-2hour of efforts of few of the gleaners goes long way ,we are blessed to live here ,over the period of time ihave learned many things just by doing gleaning ,we hope more people come and help with this worthy cause ,much much thanks to morning glory farm for being so so generous for years and to Jamie who brought me to this program . I find funny that the people who live there didn't realize that the Vinyard has hungry Children., Shame on them., the live so Rich and Private that the obvious in front of them., they don't see. The Vinyard should be ashamed to be called the Billionaires Playground big there are many hungry Choldren. This is a Black Mark that could be erased., but the Rich are selfish., and don't care., they have food. What a shame on them. I think many of the folks on MV who have money are more than willing to donate. Candidly, they don't know where to ... this article was helpful to direct them to options. Thank you for this article. I see some evidence of this problem from time to time, but I never knew the scope of it. Shame on all of us who love MV for allowing it to persist, and thanks to the people there who are working to alleviate it. I have been a supporter of local food banks in Washington, DC for years. I had no idea as to the extent of hunger as an issue on MV. Thank you for the article. I will look to include MV food banks in my annual charitable contributions this year. There is also a fund set up called the MIND fund "Meeting Island Needs Donation" fund set up through the county to meet gap needs. If someone needs to pay rent and taps in to their food budget , let's say , while waiting for unemployment , then it helps to be able to provide stop and shop cards or reliable gift certificates and /or help with other things, like shoes for a child. My goal for myself and every able bodied person I work with , is to support and encourage self sufficiency. Barriers for parents , can be, working several jobs, limited time , figuring out how to eat healthier on a budget and plan and prepare meals weekly , within time constraints. So it's not always just about money per se , it can be many reasons why this issue is a challenge. I'm just starting out , just graduated from college, back in to the work force, recently secured affordable housing. It's a process to become established. All these factors ( including transportation and childcare) have to come together at the same time to overcome poverty and that affects food insecurity. I always say "nothing worth having comes without hard work" our residents get that. This community , through gleaning, donations, supporting our kids , breathes life into the population working very hard to overcome obstacles. Each act of kindness and generosity moves a person struggling, forward. I overcame great obstacles and stayed in college thanks to Betty Burton and the many people who helped us through food, including community suppers. It's incredible the difference food, a hot delicious meal or rich snack, can make in a person or family's life. I'm not wealthy or anything ,but I'm headed in the right direction to become more and more stable and independent. I don't leave a stone un turned to seek out ways to move forward. My children are healthy and happy. I'm more than grateful and never forget where we were a year, two, three years ago. That's the impact one person or more can have on human lives! Thankyou to Louisa for being an excellent teller of the what I hope , is the beginning of a movement to expand on the great work so many have begun! Happy thanksgiving to all! "Most of the well to do here did not exactly earn their wealth on the up and up...." What does that mean? My husband and I work hard for what we have, and like most people we are honest. Great article. For those reading the comments, I also want to mention the Community Groceries Program. When shopping at Cronig's you can add one of 6 items (or a cash donation) to your order at the check out counter. Just ask at check-out how it works or see the program's banner above the registers. It only takes a second and at the end of the month the groceries everyone has selected are taken to the food pantry for distribution. In the last year the program has raised almost $17,000 worth of food and Cronig's has contributed 25% of that. It is easy to do and so appreciated. Make giving a habit! Maybe we can feed, clothes and give separate apartments to those in need inside the 8 million dollar fire station, the soon-to be constructed 6 million dollar town hall in Oak Bluffs or the 27 million dollar Martha's Vineyard museum so that the needy will get a chance to feel the love. Thought the same thing when I got the appeal letter in the mail for a history museum-whole lotta money for nothing terribly important. Thanks for this informative article and the many suggestions where help can be provided. Regardless of the circumstances, in this country people going hungry is unacceptable, and unthinkable for children. Thanks so much for the reality check. I've been wondering if I'm the only person on MV who can't afford to pay 100% more for organic, non-GMO yadda yadda yadda. The food fetishists get more attention than those who go hungry. I put a couple of bucks in the Vineyard Committee on Hunger jar almost every time I shop (at Reliable, of course! ), but I'm going to do my best to do a little more. Ah, but then you get the Save the Deer protesters. Donate unused food from supermarkets and restaurants? The board of health or other bureaucrats will stomp that out. Easy solutions made complicated by small-minded people. Food is donated by the markets all the time. Every community dinner I've been to has had donations from S&S and others. A good but sad article. All of those who have the opportunity to have a second home on the island should give back and donate to one of these worth causes. We certainly will. Afterall, we are all family on Martha's Vineyard. Those who own second homes are are the most generous people on the planet. Just because they didn't donate to your favorite charity doesn't mean they are skin-flints. I have never seen more charities per square mile looking for and RECEIVING generous donations than on this Island. Every fall we close down our house for the season. There is always plenty of unopened food. Some comes back to the mainland some is wasted. Is there an agency that is focusing on this seasonal turnover? There are many ways people pay into an economy. Those who may not have monetary wealth today may have ancestors who pioneered MV with their hearts, hands, and spirits. Others who may not have monetary wealth may be hose who are the very backbone and fabric of the island community that keep MV operating, interesting, inspiring, creative, educational, and socially diverse; all of the factors that appeal to and attract tourism. Martha's Vineyard's pride, presentation, and pretentiousness (all wealthy tourism locations have a healthy does of pretentioness) must include all members of its community. It is beneficial for the image and reputation of MV for all of its residents to at the very least have the base essentials of shelter, food, and medical. This is MV, there doesn't have to be a downtrodden class because there is enough wealth and resources where the least of us can survive with dignity. Charitable programming on MV can be distributed in a more discreet and dignified manner that does not expose, exploit, nor embarrass those with less monetary wealth and less monetary earning opportunity than others. This is MV, why not carry out charitable efforts with same panache given to all other aspects of island life. Martha's Vineyard needs a free community food co-op to serve its dignified low income class, working class, and middle class whom should not be perceived or categorized as downtrodden because it is logical that on an uber expensive and exclusive tourist island that not everyone can afford to make ends meet. The food pantries and gleaners can stock the free community food co-op supermarket and members work a few hours a week for groceries. This model of charitable food distribution eradicates the embarrassment of hand outs and instead establishes a new community building, community empowering, and community sustaining organization. 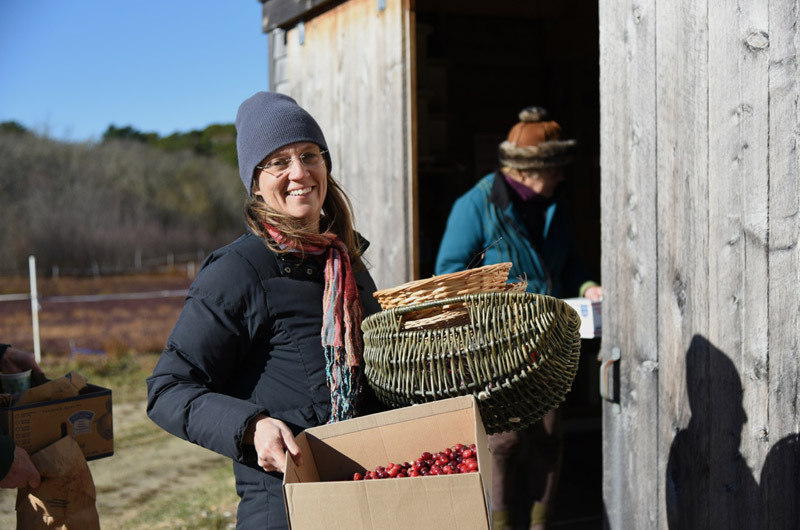 The Martha's Vineyard free community food co-op opens a world of possibilities for food-centered workshops, classes, after school programs, etc. This is MV, so of course design the free community food co-op with charm befitting MV! Then you'll will find people of all classes and even wealthy seasonal tourists wanting to volunteer and donate to "Martha's Vineyard's free community food co-op where people are indeed earning their piece of the pie."